As there are some heavy impurities like graval, scrap iron, dust, staples, stones, glasses and some other heavy impurities exist in waste paper pulp for coated paper making project, Leizhan engineers developed high efficient cleaning solutions for paper pulp processing system. Paper pulp after pulping need to be processed by high density cleaner. 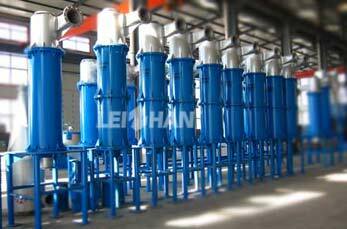 High consistency cleaner is a high density cleaning equipment to purify the waste paper pulp. It uses the proportion difference of fiber and impurities to separate heavy impurities from paper pulp efficiently and in that way to purify paper pulp in coated paper manufacturing process. 1. Can remove staple, metal, plastic and other heavy impurities effectively, reduce wear of following equipment. 3. Do not jam the slagging mouth, high purification efficiency. 4. Double cone structure, high separation efficiency of heavy impurities. 6. Applies to 304 stainless steel material, wear-resistant ceramic cone, long service life. 8. Interlock control system, less fiber loss.